Patricia M. Whittle (Pat) was passionate about painting, gardening, and playing the piano. She lived with her loving husband, Michael, in Newton, NJ and raised three children, Cindy (Wilmington, VT), Michael (Budd Lake, NJ), and Christine (Lake Tranquility, NJ) including her granddaughter Nicole who will graduate from TCNJ in May and loved to call her “Grandy." Pat was a board member, student and exhibiting artist of the Spring Street Art Gallery in Newton, NJ. Her medium of choice was to paint in oils. She was also a member of the Sussex County Arts & Heritage Council. 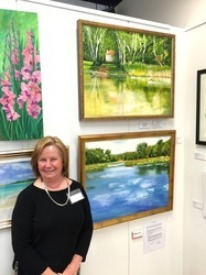 Her most recent exhibit was at Skylands Gallery in Wantage, NJ, where she won first place in August 2015 for one of her oil paintings titled "Pequest River.” Pat was also a featured artist at the Cornerstone Theatre Benefit Art Show in 2012 and Winner of the Sussex County Senior Citizens Juried Art Show in 2011. In November of 2015, Pat was diagnosed with ocular melanoma and died peacefully surrounded by her family on March 19, 2016 at Morristown Memorial Hospital. Ocular Melanoma is a rare disease. Contributions in Pat’s honor can be sent to the Ocular Melanoma Foundation or made securely online here.